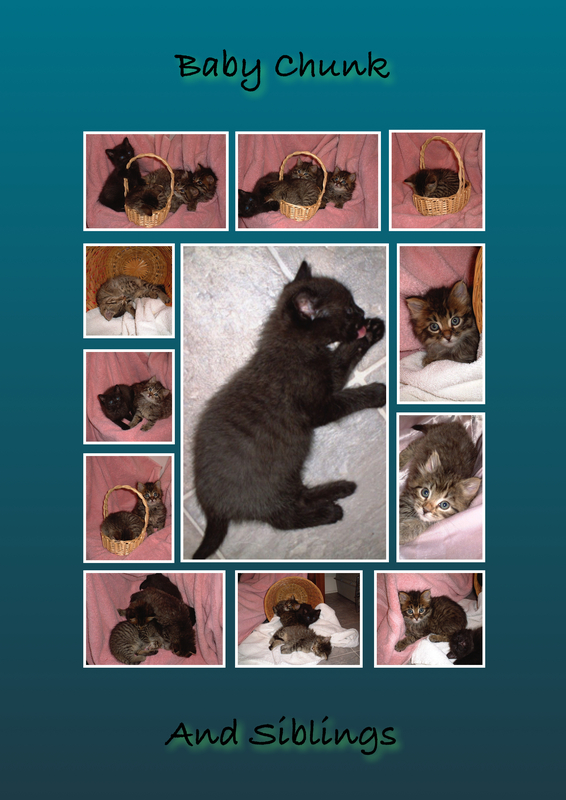 One morning I got a call from a humane society, asking me if I would be interested in taking care of a litter of orphaned kitties. A couple of young ladies had found the litter in a box next to a dumpster, they were in college and couldn’t take care of them. They took them to the school where they were doing their internship, a teacher that had a storage room near her room placed the kittens in there so she could check on them throughout the day. In the meantime they searched for someone to take the responsibility to raise them. When, I got that call from the human society a county away, asking if I would care for them, I immediately said yes. The kittens were brought to my house by the young ladies, and there was a note in the box from the teacher, Julie, that she was interested in adopting the little gold face kitten when they were old enough. So begins the long nights. I purchased bottles, formula, puppy pads, and everything needed to be a kitty mother. I started out nursing them with a bottle, every two hours, day and night, gradually adding an hour throughout a five week period. There used to be a commercial for Dunkin Dounuts, where they showed a baker, waking up really early in the morning, half asleep sitting on his bed he said, “Time to make the donuts.” That is how I felt, thinking of that commercial and laughing every time I had to wake up. It was quite a job, but it was so worth it. I thought about naming them after donuts, but I decided not to. I would feed the little kitties one at a time, and lay the full kitties in my lap to sleep, while I fed the next one. They were so sweet. Two of them were easy to feed, the little runt and a longer hair tabby. The runt was very tiny and weaker than the others, she needed a very strong name so I named her Rudie, after Daniel “Rudy” Ruettiger, his life inspired the movie Rudy. 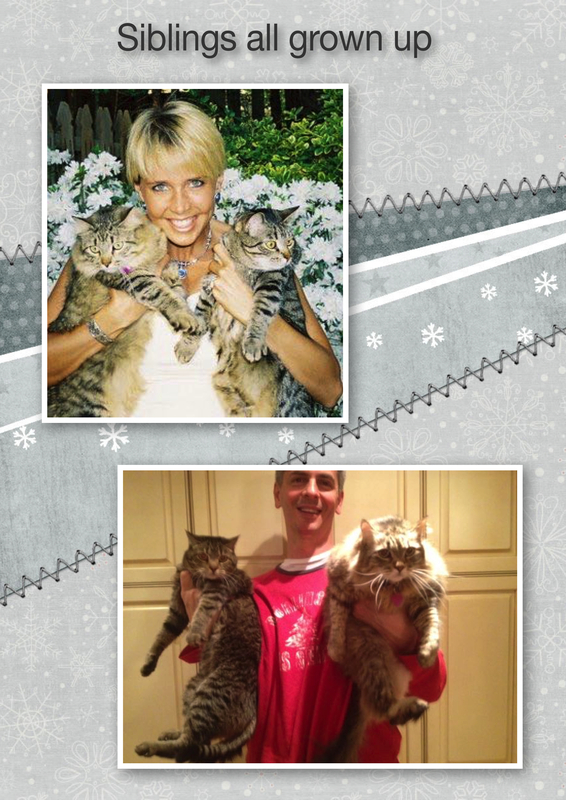 The longer hair tabby became Emily after a kitty I had growing up as a child. Later she was renamed Bettie by her new family, so I will refer to her as Bettie. Jazz was the gold face kitty, he was extremely difficult to feed, he would fight the bottle, and it took a long time for him to start to nurse. Come to find out he had lung issues, and he ended up with pneumonia, and later in life asthma. 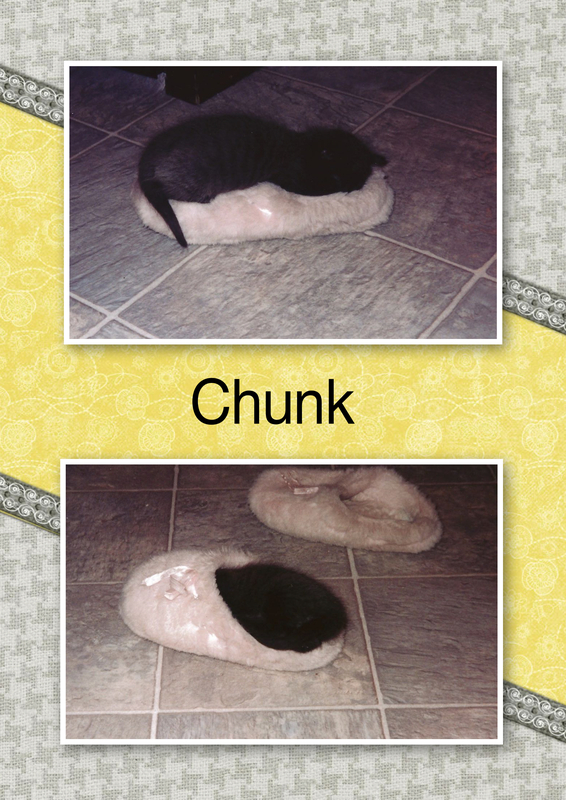 Then there was Chunk, the little black kitty, he was dark gray in the bright sunlight with little stripes. Chunk got his name, because he was like a little chunk of coal, potato, chocolate, whatever, and reminded us of Chunk from the Goonies. He took his time to eat, falling asleep as he nursed. It would take the same amount of time to feed Chunk as it took to feed all the other three combined. One week into the nursing process, I became a Girl Scout leader for my granddaughter, and I had to go to a leaders retreat weekend. I told them I couldn’t go unless I could take the kitties, they gave me permission and so that began another adventure for the kitties. While there I would let other leaders help me feed them during the day. I always fed Jazz myself, because of his issues, but they would help with the others. Chunk was always the first one I would give to someone to feed, because he was so easy going and because he took sooooo long to eat. What you may not realize, is the mother cat will stimulate the kitty, by licking their bottom for them to go to the bathroom. What I did was take a cotton ball and wipe their little bottoms soaking up the urine, and or poop. This was a process that had to be done throughout the day along with the feeding. I also took a damp paper towel and would wipe them down, as if they were being groomed by their mother. They did get real baths almost daily because of them peeing on each other. I think Chunk got more baths than most of them. He was and still is quite a character. 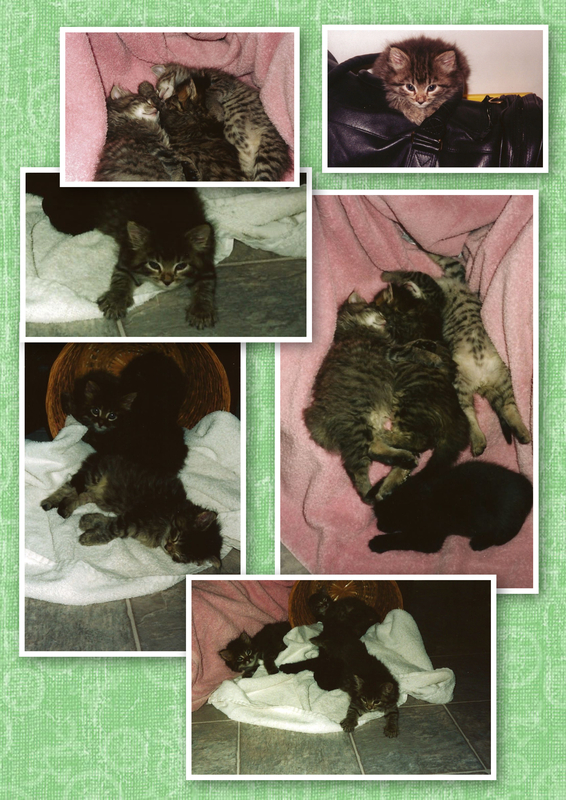 I truly loved all those little kitties, I loved watching them nurse, play and sleep. It took a lot of hours but it was so worth the loving feelings I got being around them. 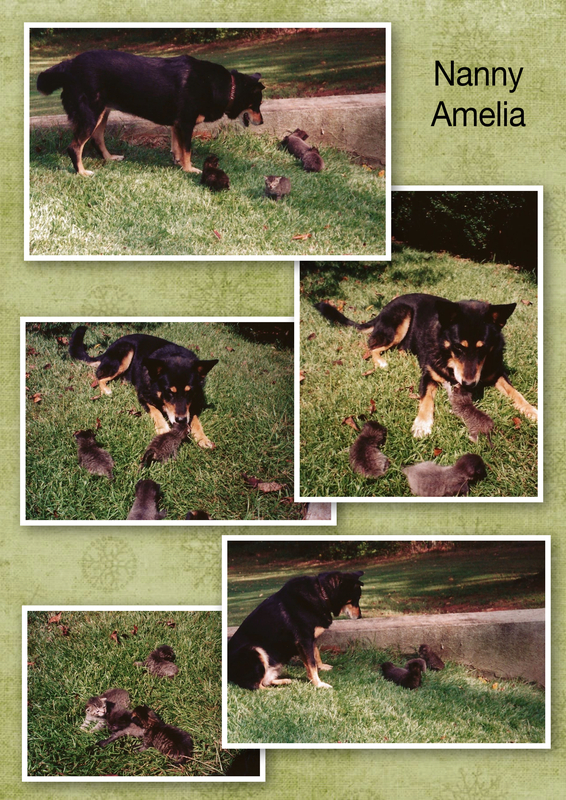 I had a female dog, Amelia, that was extremely loving and gentle, so I introduced her to the kitties. A couple years earlier, she actually brought a kitten home. I would leave food out for the kitten, but the kitten was so wild it wouldn’t let me come near it. It would eat with Amelia, play with her and even sleep on top of her on cold nights. 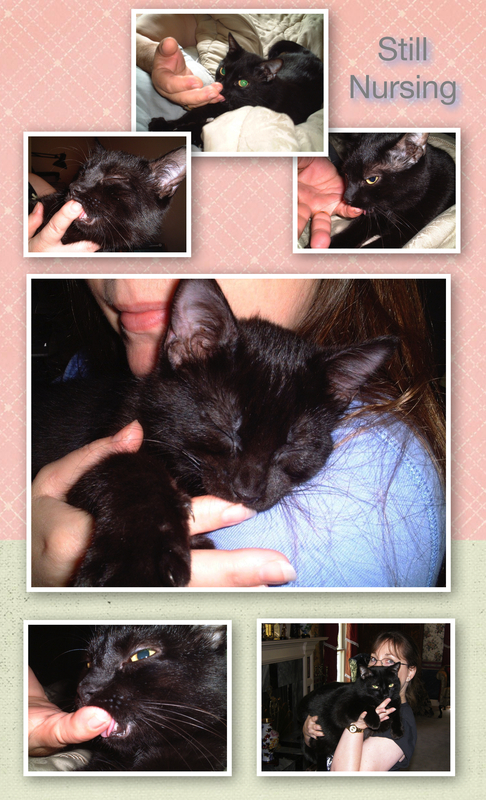 It took three months before the kitten warmed up to me, to allow me to pick him up. We still have him today, but that’s another story. I would take the kitties outside daily so that they could walk in the grass, soak up some sun and to be cared for by Nanny Amelia. Amelia loved those little kitties as if they were her own. She watched over them, played with them, herded them and bathed them. She was so gentle. 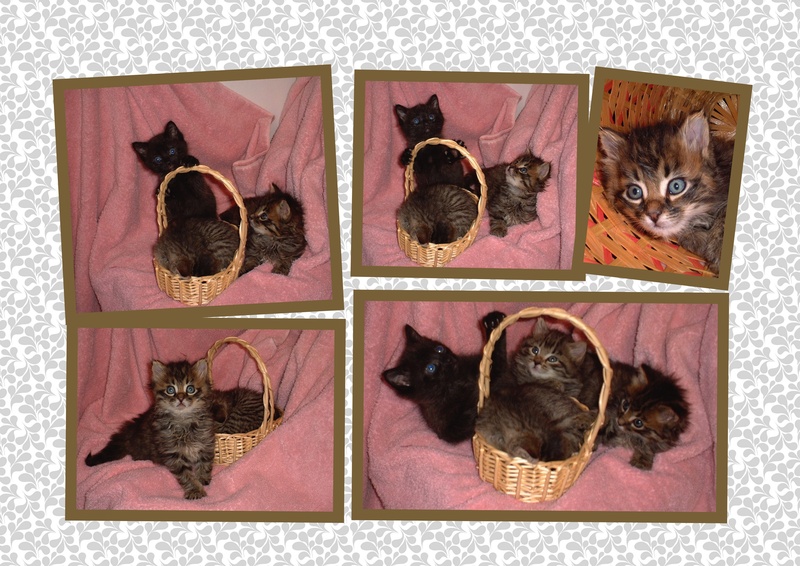 As the kittens grew, I knew the sad time was coming when they would have to go to a permanent home. I had started out telling my husband that I wouldn’t keep one, but he and I both knew that wasn’t going to happen, because I loved them all so much. I was really getting attached to Chunk and Jazz, but I knew Jazz, the gold face one, was promised to Julie from the note she left me. When they were about 8 weeks old, I called Julie to let her know that the kittens were ready. Her husband and her came out that weekend and saw them. The kitties were always kept in the kitchen area, so when Julie came I let all of the kitties out in the living room for the very first time. Rudie, who was no longer a runt, went directly up to them and started putting on a little show for them, she was adorable. Bettie went and played around them also. Jazz and Chunk went everywhere in the living room, looking for trouble. They even tried to get into the fireplace (it was cold). They were extremely mischievous. While Julie and her husband were trying to decide which one to take, I explained that I thought cats do better when they have another one to play with and to keep them company when no one was home. They agreed and decided to take Rudie and Bettie. I was so happy, because I knew those two would have a wonderful and loving home. As soon as they left, I shut the door and happily yelled to my husband, “Guess which two are left?!”. When I told him it was Chunk and Jazz, he grunted, because he knew that we were adding two more kittens to our menagerie. So now all four kitties were destined for a great life. 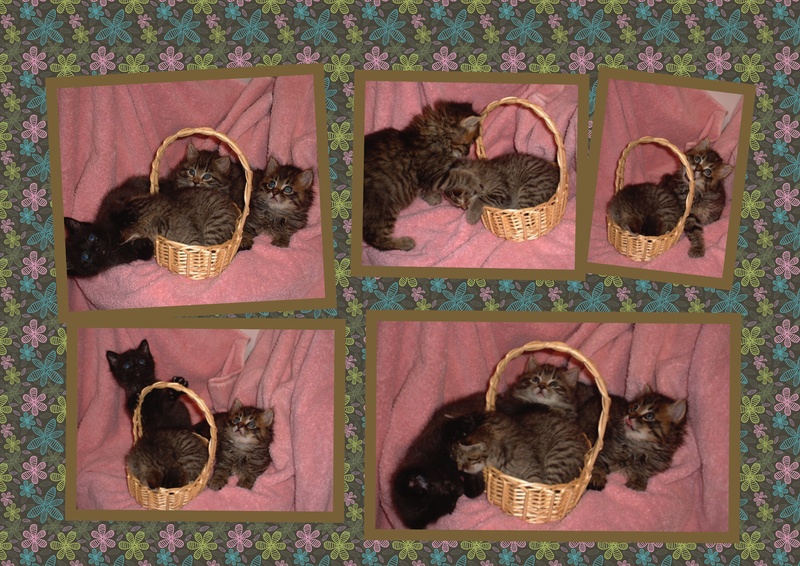 Jazz and Chunk grew, played, and got into trouble a lot, but because they had been hand nursed they were extremely loving and cuddly. Jazz took to eating with no problem, so did Chunk, but Chunk never got over wanting to nurse. 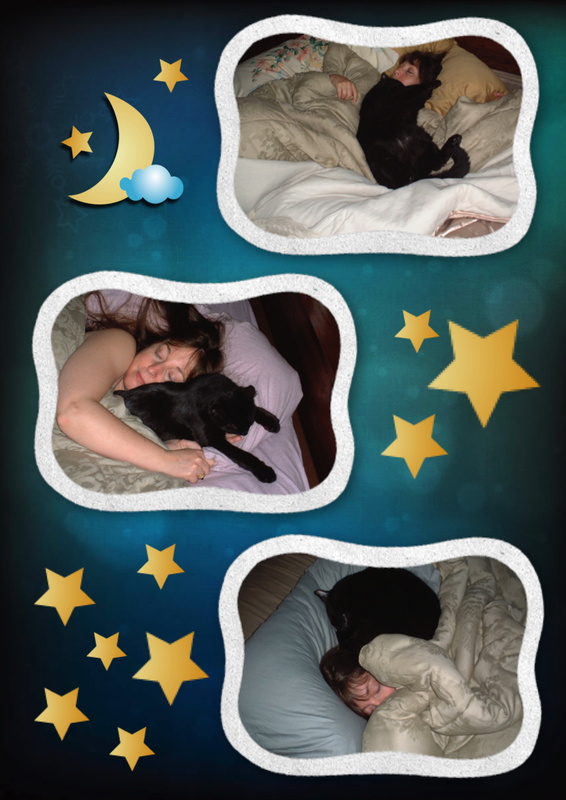 He would find either my husband or I, day or night, and would latch on to us to nurse, our neck, our ears, even our eyelids, We were getting little kitty hickies all the time. He would even wake us up in the middle of the night. I knew something had to change, so I trained him to nurse on the pad of our fingers. Not the tip but the pad, he would purr and purr, sucking on our fingers, falling asleep just like when I was nursing him with the bottle. One time Chunk found me when I was relaxing in the Jacuzzi. He jumped up on the tub, crawled onto my shoulder and made himself comfortable, not caring that he was getting wet. He found my finger to nurse on and fell asleep. Unbelievable. 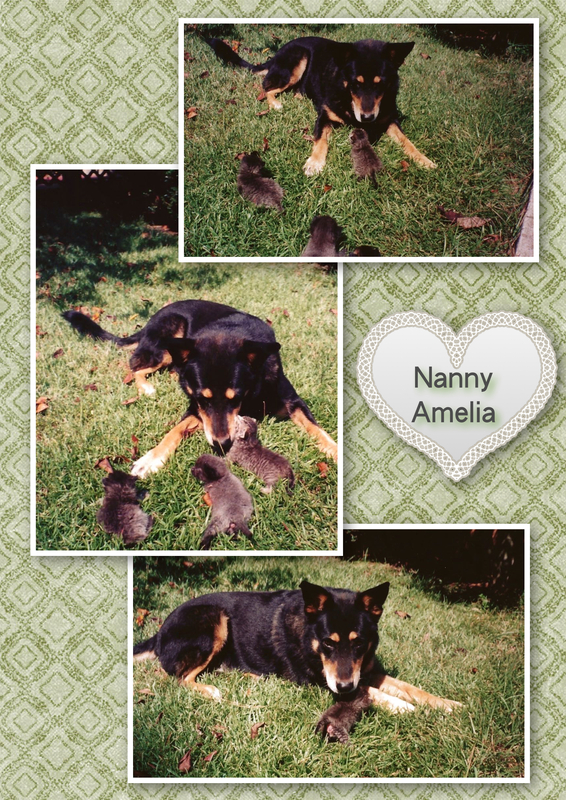 Skipping ahead a few years, Amelia got old and sadly died, so it was time to introduce a new dog. I was talked into getting a Rottweiler. I had never had one before so I knew I would have to find a real trainer to help me understand the breed. We named her Kitty, because we thought it would be funny to say here kitty, kitty and a big Rottie would come running, plus I wanted her to fit in with all my cats. 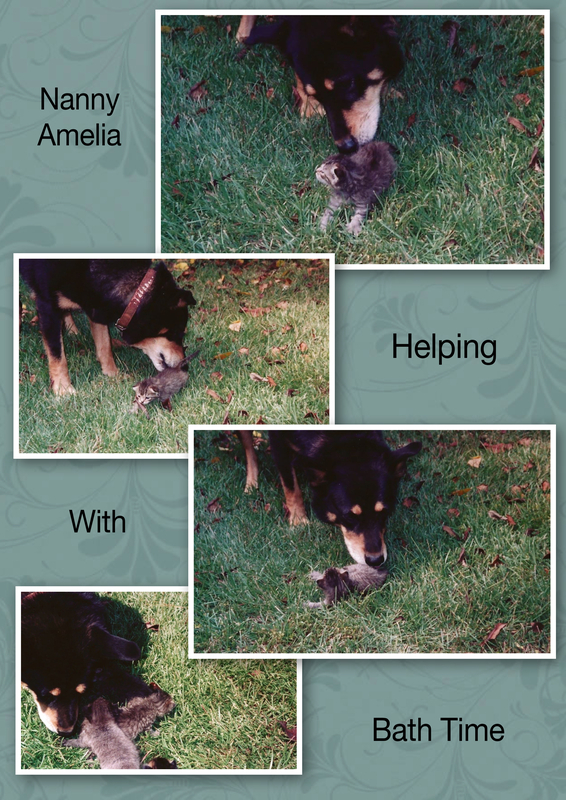 I introduced the puppy, and raised her around all the cats, and did extensive training with her. She was smart and excellent with hand signals, but I kept saying from the very beginning that something just wasn’t right with her. Everyone kept saying she was fine, so I kept up with the training. 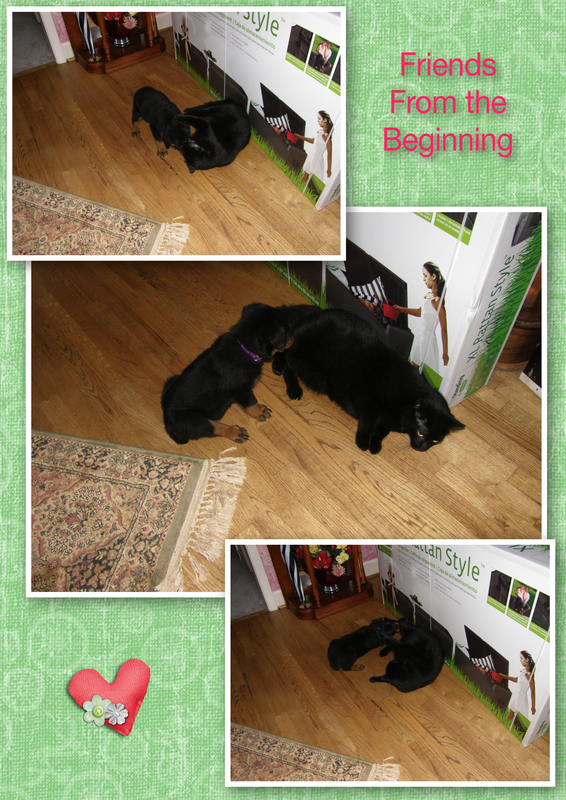 Kitty was a medium to high energy dog, so when she was two, we decided to introduce her to a male Rottie puppy, hoping this would help. 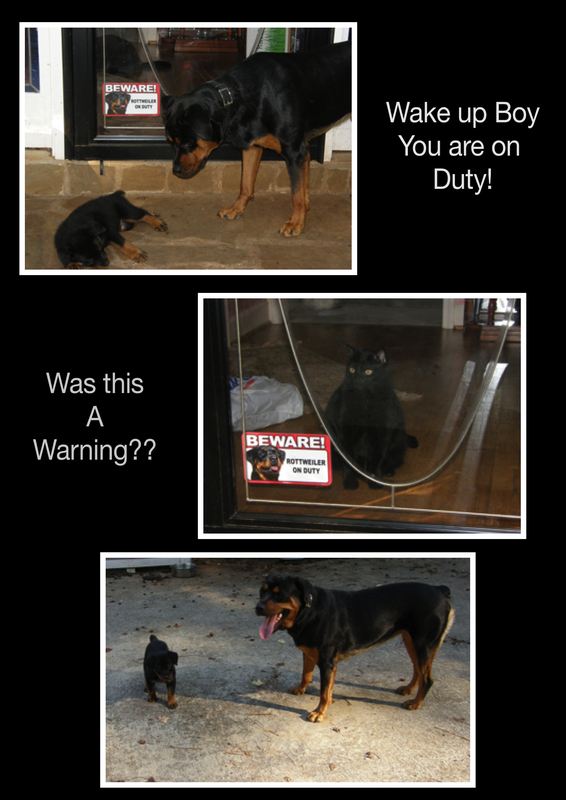 The male Rottie was named Tiger Tank, calling him Tiger. Knowing his personality now, I would have called him Tigger. Tiger was from a different breeder and he was a lot calmer. He was such a good, gentle boy that he really didn’t need a lot of training, but I did the training anyways. Chunk and Tiger became great friends from the beginning. One holiday, my husband was BBQing out back, he was throwing the ball for Kitty to retrieve, she loved that. I was on the ground in the middle of the yard playing with the puppy, Tiger. 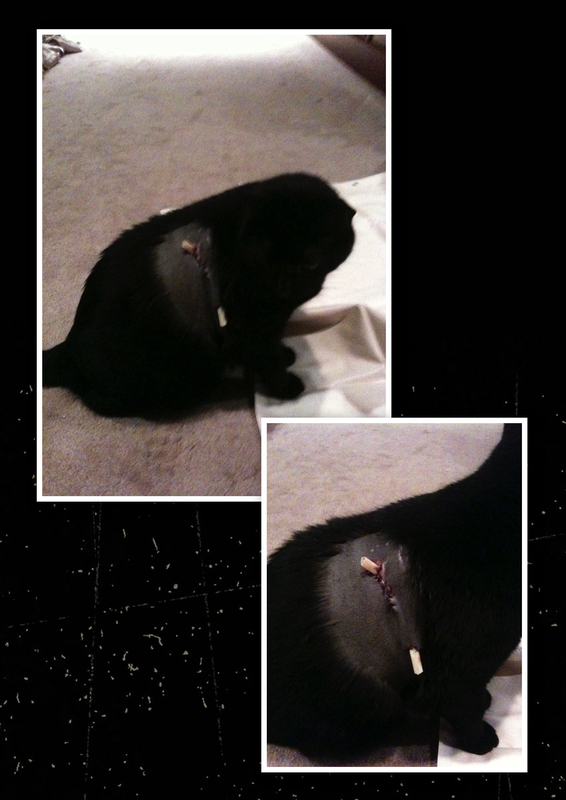 I had let Chunk out so he could enjoy some fresh air, which I had done many times before. Kitty kept playing with the ball as Chunk rolled around and watched. Tiger, decided to walk over to Chunk, I stood up to go get him, and in a split second Kitty had dropped her ball and ran over to Chunk and Tiger and started tearing Chunk up. I’m now screaming and my husband comes over and we are trying to get Kitty off of Chunk. We finally succeeded and Chunk ran off. Sweet little Tiger was just looking around going, what just happened to my friend? I ran to find Chunk, I finally found him in the woods covered in blood. It was in the evening of a holiday, my vet was not in, but on his recording was the number of an emergency clinic. I immediately wrapped him up and drove him to the clinic. They took him, cleaned him up, stitched him up, gave him some shots, and medication and later I was able to take him back home. I was distraught. I didn’t know what to do with Kitty, I wanted her out of our family. I really loved Kitty, because she was really sweet to me but there was no reason for this attack. We already had another cat licking all her fur off and was on a kitty Prozak, more than likely because of Kitty trying to attack her when I wasn’t around. I kept Kitty for a little longer, giving her another chance, even though she had bit me before, growled at the cats and tried to aggressively catch them many times. I still tried to train the PREY out of her. Another night she snapped at another cat, that was just walking by, fortunately I was right next to her, and was able to grab her collar, so she couldn’t attack. But I knew, that was the last straw, she was no longer a good fit in our family. Another family without cats was found immediately. After rehoming Kitty, it took about a year for all the cats to settle back down. In the meantime, Chunk was losing weight. He had always been a heavy boy, so at first I just assumed that he was losing weight because of the traumatic experience he had. But after a couple months and he was still losing weight, I took him to the vet. They did a series of blood tests on him and it came back that he had Diabetes. I had never heard of an animal having Diabetes. I to this day believe that either the shock of the attack or something the clinic gave him when they fixed him up, triggered the Diabetes, but I will never know. 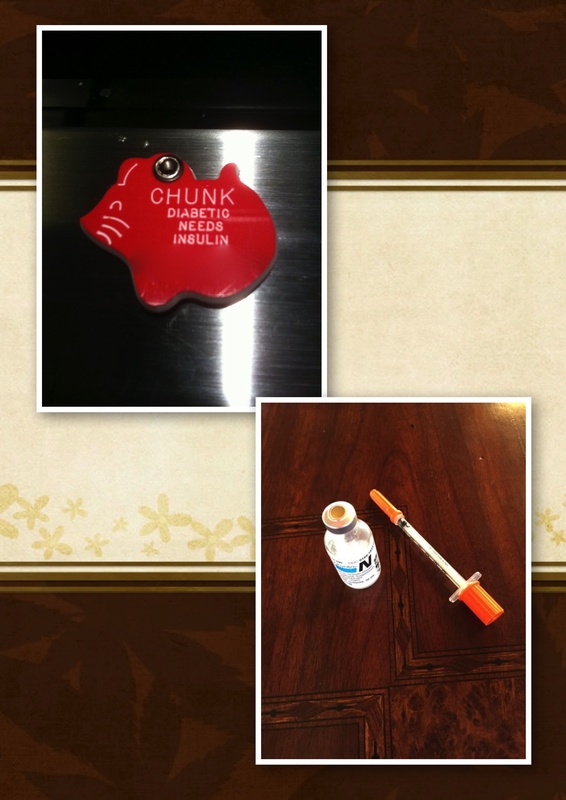 Chunk was now a diabetic and he had to have two insulin shots a day. This put quite a jolt in my husband’s and I schedule, now we had to work every day around Chunk’s schedule. But Chunk is so worth it. I got him a special tag made so that if he was ever lost, they would know he was a diabetic, along with my phone number to contact me. He was already microchipped, so I added that information to his profile too. Our lives changed because of his Diabetes, it is hard to go anywhere for a day, much less go on a vacation. 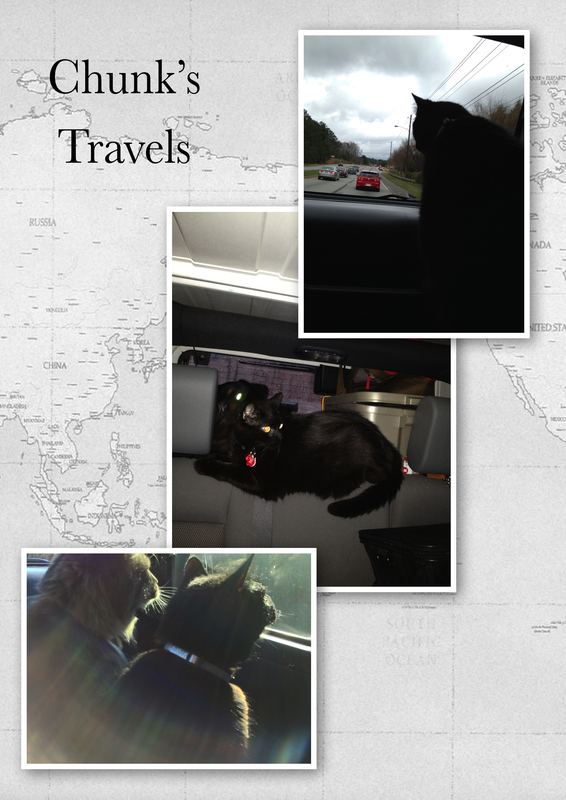 We are fortunate to have our own mountain home that we can take all our animals to, so Chunk has learned to travel. He has traveled many places. Unlike some of the other cats, he prefers to ride outside of his carrier, in the back seat. He likes to look out the window. If I am driving by myself I block the back seat so he can’t get up front. If my husband is driving, sometimes Chunk will sit on my lap in the front seat so he can view where we are going. He is amazing. He loves everyone and everyone loves him. You would think after being attacked by a dog that he would hate them, but not Chunk. He forgives! We can learn from him, that we should forgive and move on. 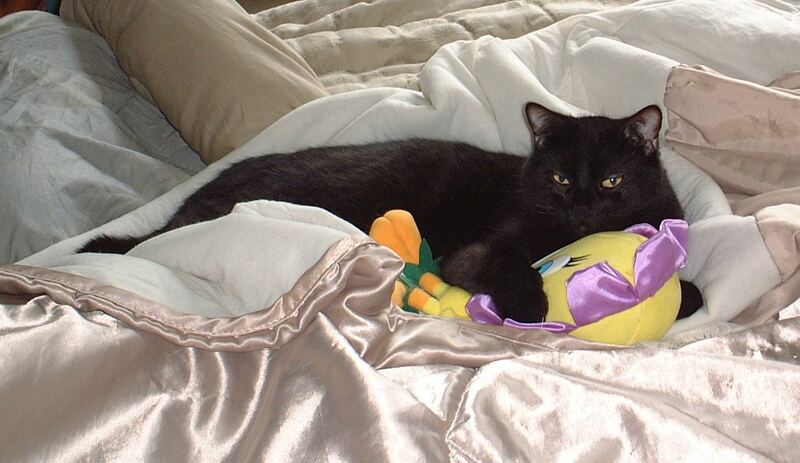 He loves Tiger, and forgave him, even though Tiger was right there during his attack. Tiger and Chunk are best friends. You are probably wondering how the other kitties are too. Jazz died at age 9, due to complications of his lungs. I feel so fortunate that Jazz was able to live that long. 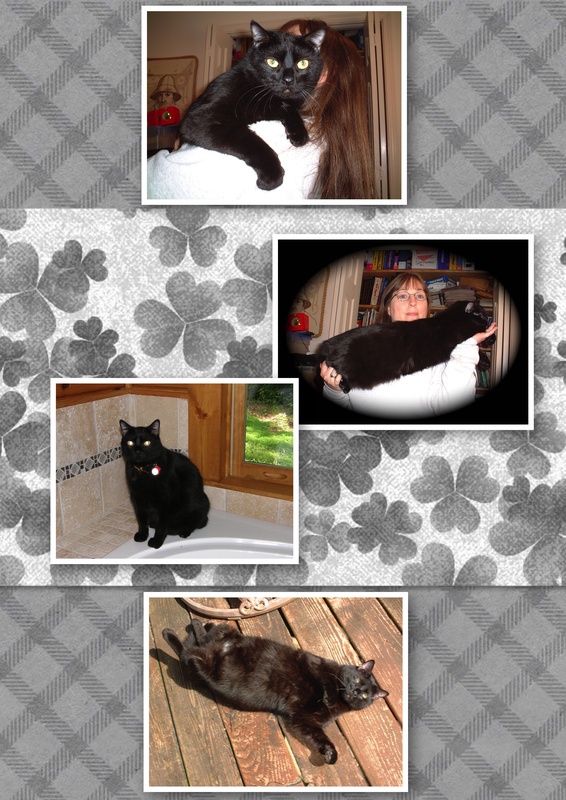 He was huge, furry and extremely loving. 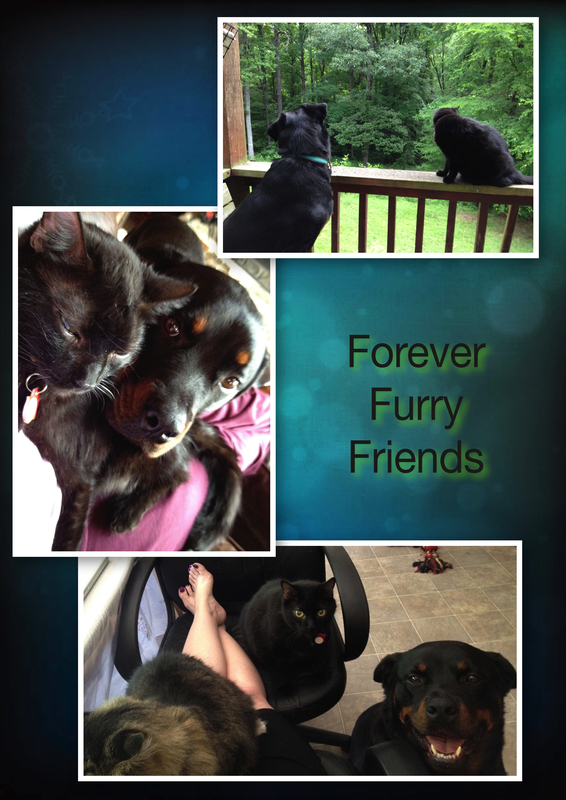 Rudie and Bettie are still doing great with their loving family. Very Loving! He has to sleep around my head, sometimes I wake up because he is laying on my face. And sometimes, my husband is abrubtly awaken because Chunk is walking across my husband’s face, with his (Chunk’s) furry belly dragging across his face. Very Mischievous! If you are walking up the stairs, he will run up and stop on the stair in front of you so that you have to pick him up and carry him the rest of the way. If you try to ignore him he will continue to stop in front of you. If he is upstairs and and he sees you are coming up, he will run down, just to hitchhike back up on your shoulder. 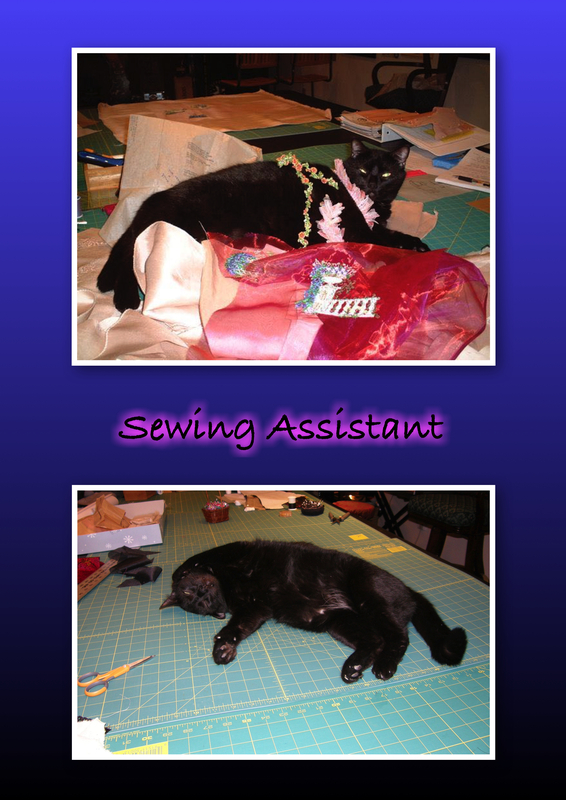 He helps me sew, as my Sewing Assistant. 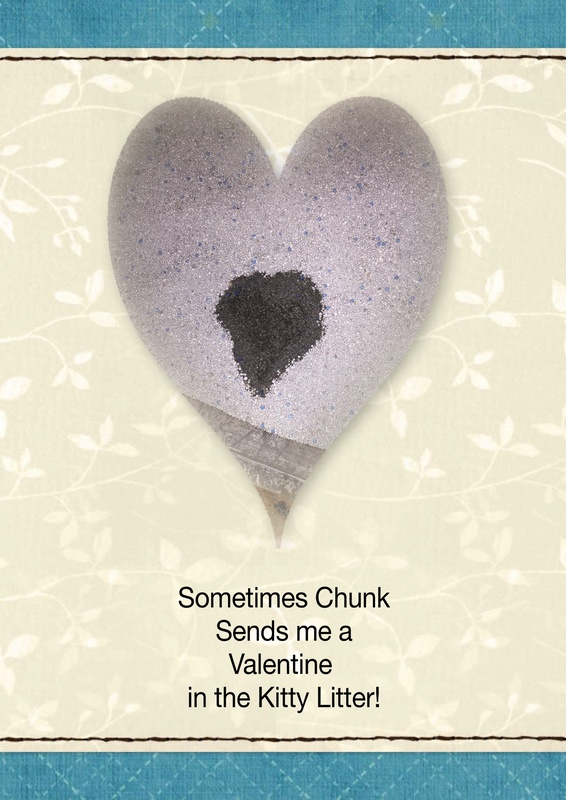 He sometimes even leaves me little hearts in the kitty litter. And YES, he still nurses. He doesn’t get suction anymore because he had to have a fang pulled, but he still has to nurse. He is so big and persistant, that you have to stop doing whatever you are doing to let him nurse. He even still wakes me up in the middle of the night to nurse on my finger. 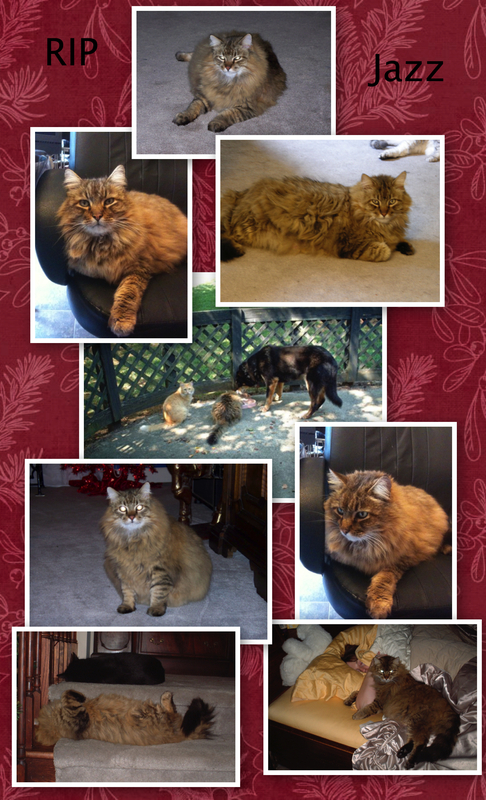 I am so thankful for those kitties being a part of my life, I gave them a life and they gave me LOVE, LOVE, LOVE!! I would do it all over again. I think we can all learn how to love, laugh, to not give up, to have strength in unfortunate situations, and how to forgive just from Chunk’s life. 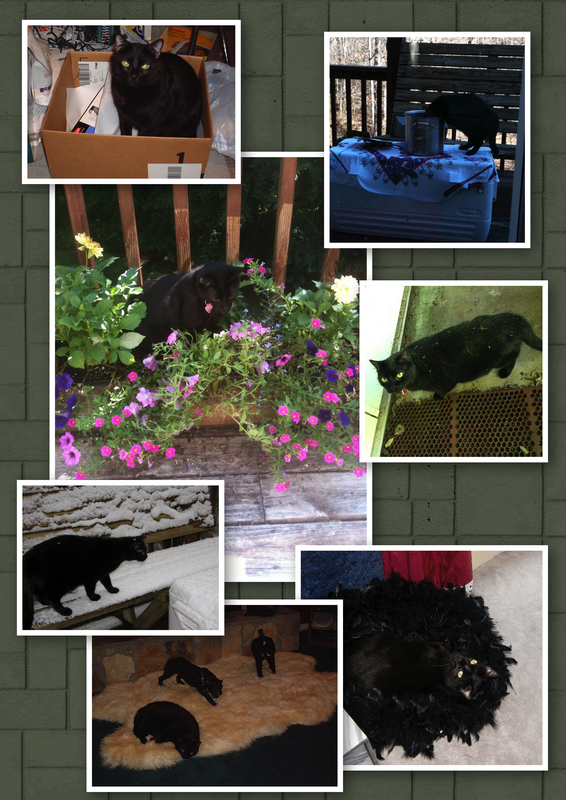 This entry was posted in Diabetic Cat and tagged Cats, Diabetes, Diabetic Cat, Forgiveness, kittens, orphaned kittens, Sewing Assistant. Bookmark the permalink. Oh Martina, just yesterday I asked if anyone had heard about Chunk’s condition, I am so sorry for your loss, you did a wonderful thing, and were rewarded with love and devotion! So very sorry you lost a family member, that you cared for and loved so much! Hi Martina I just now read your story and it’s a real learning one, thanks for sharing that very important part of your life. What an amazing story!!!! So glad you didn’t lose my number in the box of kitties…. Bettie and Rudie have been the best kitties in the world. Thank you for nursing them and giving them life.